Fuerteventura is the closest of the Canary Island to the African coast and is only 98km from Morocco. 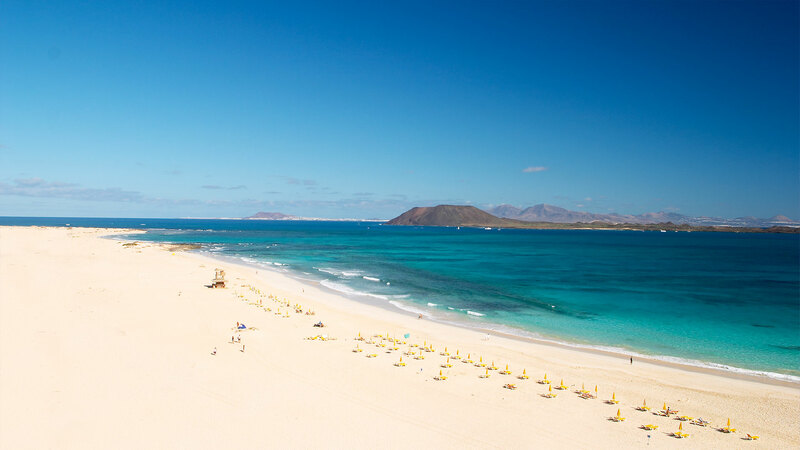 None of the islands have as many beaches as Fuerteventura and although the terrain is similar to Tenerife, the island has some of the most impressive beaches in the whole of Europe. The island is well connected with most European International airports and if you fancy travelling between islands, the Fred Olsen or Armas ferries travel regularly. Water sports are very popular in Fuerteventura. Each year in July, hundreds of surfers descend upon the island to take part in the P.W.A world windsurfing speed and slalom championships in the south of the island. Golf is also a popular sport here on the island and tourists have a choice of three 18 hole courses to choose from, The Fuerteventura course, Las Salinas course and Las Playitas course. A hire car is the best option for playing these courses. As like in mainland Spain, the island people take a Siesta between One and Four in the afternoon. They tend to have their main daily meal at this time and a light meal in the evenings. But on weekends this changes and locals can be seen entering restaurants at 11pm to have dinner!